1. It looks way tooo fancy for anyone to believe that you whipped it up in under 30 minutes, so major brownie points when guests come over. This is really my mum’s recipe and she deserves major credit for this. I’m sure she’s not going to find out because she hardly ever reads my blog. SHOUTOUT to MOM and a big HINT – Please start reading my blog more regularly! She’s going to kill me for this, but it had to be said. As kids, we would always demand things that she needed to pull instantly out of her magic hat. And this no yeast naan recipe came from there, I think. We love you MA, mainly for this naan! I’ve made this a few times now, for Denver first, so that he can approve (he’s my guinea pig if you haven’t guessed that already) and some friends after that. And I’m happy to report that this got a BIG thumbs up every time. Last night, War and Cheese was over for dinner, and this no yeast naan made an appearance again, along with some mutton fry and chicken. Over lots of laughter and good times, we broke bread together, wishing there was some cheese stuffed inside these little beauties. But until next time. Would you like to see variations of this recipe? Maybe some no yeast Naan Pizza? 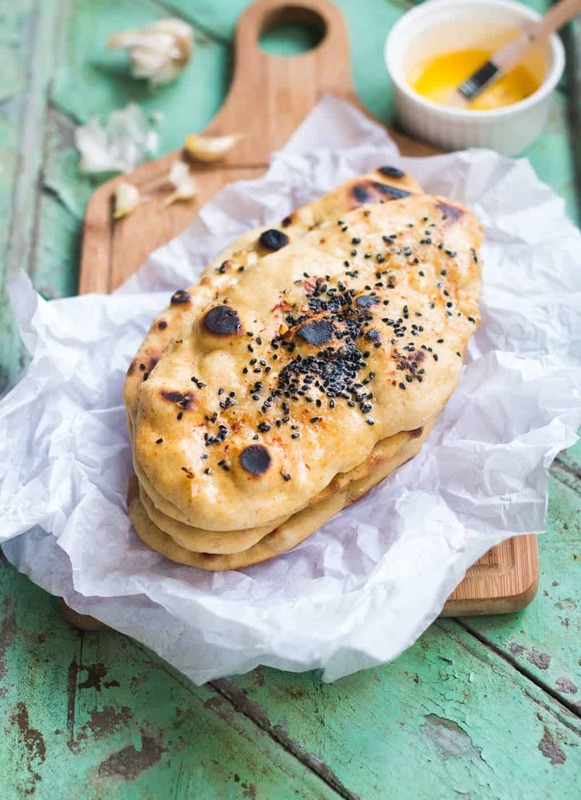 Leave a comment on the blog or connect with me on Twitter where we can talk more about how awesome this Instant Naan is. 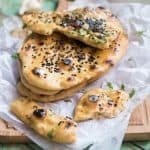 Instant Naan bread recipe which doesn’t require any yeast or eggs and takes only 30 minutes from start to finish and can be made on the gas stove in a skillet. No oven or tandoor. In a large bowl, mix together both the flours, baking soda, sugar and salt. Stir to combine well. In a glass, mix together yogurt, water and oil. Start adding the yogurt mixture to the flour mixture little by little, and keep kneading the dough as you go. If the dough is too dry, add water by the teaspoon or some extra flour if the dough is a little wet. Knead for a few minutes till the dough is soft and supple. Cover with a damp towel and set aside for 20 -25 minutes. Heat a flat non-stick pan or skillet or tawa. In the meanwhile, lightly roll out the dough to 1/4 inch thickness without applying too much force. Use a little dry flour if the dough is sticky. The shape doesn’t matter. Brush the top lightly with water, and sprinkle with sesame seeds. Lightly press so that the seeds stick to the dough. Turn it over, and brush the other side with water as well. Now place the bottom side down (without sesame seeds) on the tawa so that the side with sesame seeds is facing up. Cover immediately with a lid, which should be big enough to cover the naan. The naan should start bubbling up. Wait for 45 seconds before flipping it over. Give it 30 seconds on the other side as well, and take it off the pan. Apply melted butter immediately and serve hot. How would I cook this recipe in the oven? Hey Rashana, I’ve never tried making this in the oven. But pre-heat your oven to 220C and then place the naan on a baking tray. Bake for 4-5 minutes or till the naan puffs up. How many naans from this? Thanks so much! So glad you liked it. I mixed some chopped coriander In the butter, before brushing on top of the garlic naan. As they do in the Punjab, traditionally, instead of butter, they normally use desi ghee. Also, they prick the naan with a fork before placing it on the cast iron tawa so that air bubbles do not get trapped during the cooking process,But then, they do not use a cover to cook The bread, they turn the tawa upside down, on the flame, when one side has been cooked. Do not worry about the garlic , cooked this way getting burned it just gets slightly golden and crisp.Watch where you are placing the tawa above the flame! Not directly. Just to one side… And also, the water with which they do the brushing is salt-water– 2 Small pinches of salt,In a little bit of warm water. This helped it to stick by the sides of the clay tandoor and it is going to do the same, when placed on the tawa. Thanks for the tips! Sounds great! I made this tonight, it came out fabulous! Never thought Naan could be this quick and easy. Thank so much. Hey Bandung, yes you can. Heat your oven to the highest setting possible (Between 220-250 degrees). Place the naan on a silicon mat or greased parchment paper and bake for 4-5 minutes till it starts puffing up and brown spots appear on the top. If you don’t have a tawa, just use a skillet or non stick pan. Oh I hope you do Paige! You’ll love it! This looks so delicious! 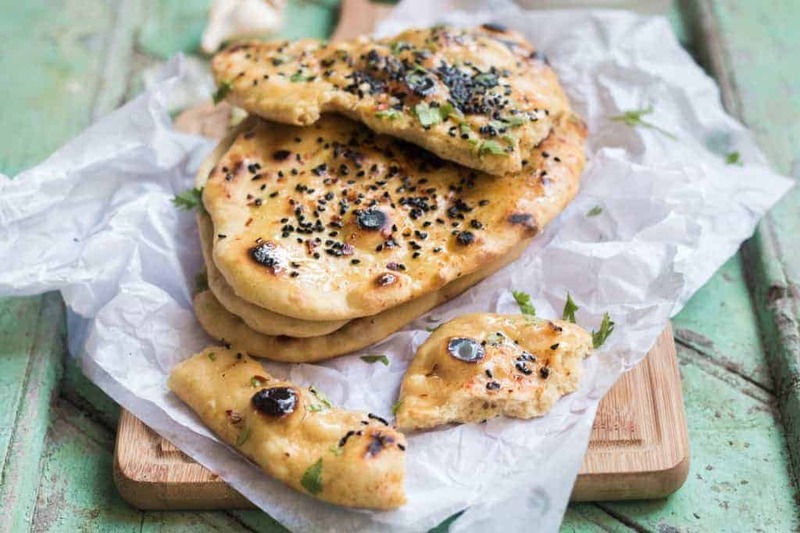 I have never tried making Naan, but I may have to give this recipe a go! Yum! Quick bread recipes always get my approval! This looks amazing and so tasty! 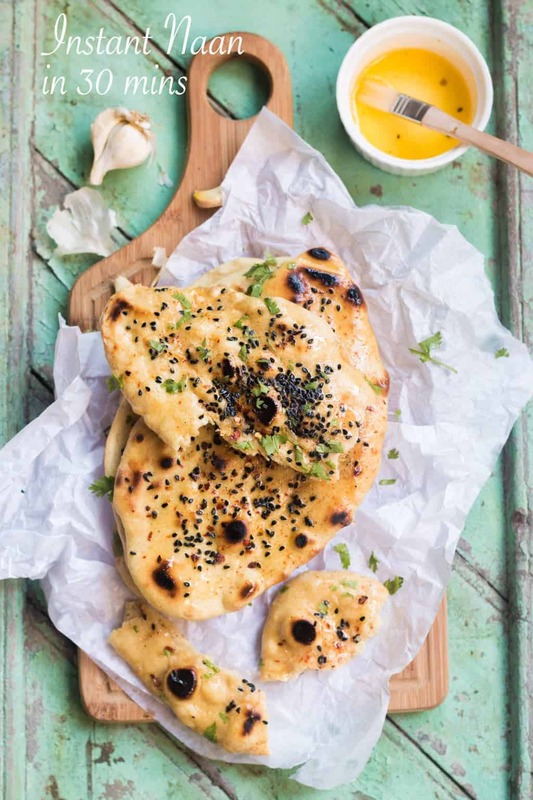 I love Naan, this is a great recipe to have on hand, pinning! Kathryn she totally deserves it for not reading each and every one of my posts as soon as it’s posted 😛 But she’s such a sweetheart. She’ll be thrilled to know that people like this recipe of hers. Thank Sarah, you are always so sweet 🙂 I was surprised at how easy this is. And fantastic for curries, dals and kababs! This looks amazing -like it takes waaay more than 30 minutes! As always – love all your photography – so beautiful! Thanks Nisreen. I agree, they are timeless! Moms recipes are the best… Beautiful photos???????????? Athletic, absolutely, this is crazy easy and crazy delish! I love making naan bread! Love that this is made in 30 minutes! win-win! I loves that board!! Since I got to taste this yumminess I have to say this is just awesome! !